In 1987, Sesame Street writer, composer, producer and general all around talent Chris Cerf collaborated with actress and social activist Marlo Thomas to publish a book and record album, Free to Be…A Family. This was a follow up to her much loved book, album and program from the 1970s, Free to Be…You and Me. 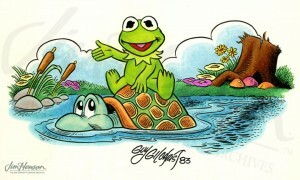 The second album included Kermit singing “Something for Everyone” and “On My Pond” and the book featured the “Pond” song. The project grew out of Thomas’s experience becoming a step-mother to a large family when she married television personality Phil Donahue. Researching the situation, she found that a very small percentage of American children were growing up in what might be considered traditional family structures. Just as her first book and album helped children feel good about their genders, Thomas’s second effort was meant to make children feel comfortable in their family arrangements, however unorthodox. To promote the project, Kermit, wearing his Sesame Street reporter’s outfit, introduced and interviewed Marlo Thomas on her husband’s show Donahue. Together, they sang “Something for Everyone,” and Jim was interviewed. The following year, Jim collaborated with Thomas on a television special, Free to Be…A Family, which, instead of talking about domestic situations, promoted interaction between children in the US and the USSR. Critics found it odd that the theme connected with this title had changed so much. Steve Weinstein in the Los Angeles Times wrote, “It could be argued that in today’s social climate a television show dramatizing the book’s theme of liberating the American family from its traditional stereotype would be more urgent than a documentation of the new-found friendship between the United States and the Soviet Union.” Given Jim’s philosophy that, globally, we all in live one house, perhaps it did make sense to think about family dynamics and international relations under one umbrella. See Kermit sing about his home environment in “On My Pond”. Learn more about Jim’s work with Marlo Thomas on her 1988 television special Free to Be…A Family. Baby Kermit at home on his pond in a cartoon by Gary Gilchrist, 1983. This entry was posted in 11-November '87, Appearances and tagged Chris Cerf, Kermit, Marlo Thomas, Phil Donahue, Sesame Street, Steve Weinstein. Bookmark the permalink.